Please click here to view our Newsletter in pdf format. To download the documents RIGHT click over the links below and select “Save Target As” or “Save Link As”, then save it onto your P.C. Please note that some computers may allow you to left click and open the documents below but this depends on your setup and software. Note for MAC users: Safari is unlikely to render the text properly when viewing within the browser. This is why we suggest you “right click” and download as you will then be able to open the document in a pdf reader. Depending on your set up you may be able to do this after having left clicked and opened the document in Safari. If you have done this and are having trouble then right click the document in Safari and see if you have an option to open in a pdf reader. On an IPAD the approach is similar but of course you cannot right click but can tap the screen and use the open with option top right. 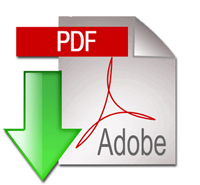 The Adobe Reader is free and available for download here.